Over the years, preservatives have gotten such a bad rap, particularly for cosmetics. The damaging effects of parabens and formaldehyde, among others, have effectively vilified a whole ingredient component which is actually a vital element for most consumer products! Since most cosmetic products contain water (as well as other liquids and aerosols), they are highly susceptible to pathogens like bacteria and mold. If you don’t want to find funky stuff growing in your favorite moisturizer, broad-spectrum preservatives are non-negotiable. While some may tout them as “bad for you”, going preservative-free can actually lead to skin irritation and potentially fatal infections. A good preservative does two important things to a formula: extend product viability and discourage pathogen growth. Preservatives are decidedly not the useless additives that fearmongers would have us believe. There even exist several options that actually benefit the skin! While it is true that in high doses, some substances used as preservatives can be harmful, the amounts used in cosmetics fall within a safe range that offer more benefits than risk. Let’s get to know them to sort out the good from the bad! Sadly, there is no truly naturally-occurring substance that can be used as a preservative for consumer products. Yes, pure honey never goes bad, but once it is mixed with other liquids, it becomes a contamination risk. Imagine how much goopier that would make a formula, regardless of how skin-caring the rest of the ingredients are! Glycerin can be considered natural in the sense that it can be naturally found in skin. It can be an effective preservative at 70% of a formula. At this percentage, it would make formulations extremely sticky, as well. Glycerin is found in many beauty products, but never at a percentage where it would work as a broad-spectrum preservative. Some antioxidant-rich fruit and plant extracts are sometimes used as preservatives in cosmetic formulations. Vitamin E, rosemary extract and grapefruit seed extract have become popular choices for formulations that shy away from synthetic preservatives. At first glance, using antioxidants as preservatives seems like a win-win, extending product life while affording additional skin care benefits. But in reality, antioxidants do little to prevent the growth of bacteria and mold. They do help slow down the process of oxidation in oils and butters, making them viable for a much longer time. Also, did you know that parabens (butylparaben, ethylparaben, isobutylparaben, methylparaben, and propylparaben) are naturally derived from plants? Studies have proven them to be endocrine disruptors, but NOT when they are applied topically. We previously reported that studies have indeed observed these substances cause skin samples to break down – at 100% concentration. Used as a preservative, these have been cleared even by the strictest international regulations body (that of the European Union) for up to 0.14% of cosmetic products. These are also relatively inexpensive, proven effective even at less than 1% concentration, and non-sensitizing to the skin. No wonder many products opt to use them as preservatives, regardless of their negative reputation! Phenoxyethanol is another demonized ingredient yet it naturally occurs in green tea! It’s another popular preservative choice for many beauty brands because it affords pathogen protection, works well within a wide range of pH levels, and is stable. The negative research that links it to allergic reactions and eczema, as well as adverse nervous system function in infants all resulted from exposure via oral ingestion. With the majority of formulations using only up to 0.6% of this ingredient, topical use is generally safe. You’d be hard-pressed to find formaldehyde or its liquid counterpart formalin listed in any ingredients list today. But did you know that formaldehyde-releasing preservatives are widely used even now? Bronopol (2-bromo-2-nitropropane-1,3-diol,), DMDM hydantoin, methyldibromo glutaronitrile, and quaternium-15 are some ingredients that belong under this category. Methylisothiazolinone gained popularity as parabens gained villainous reputation. It is more commonly found in wash-off products like shampoos and cleansers, since it has been known to be too sensitizing for leave-on products. In fact, the European Union limits its use to only 0.0015% in cosmetic products - that’s barely a drop in a 1-liter container! It also gets trickier: Naticide is a popular preservative used in natural skin care products. The surprising thing is that it’s expensive, ineffective as a broad-spectrum preservative, and has a vanilla scent that causes irritation! You won’t find this in any ingredients list though, as it is a trade or brand name. 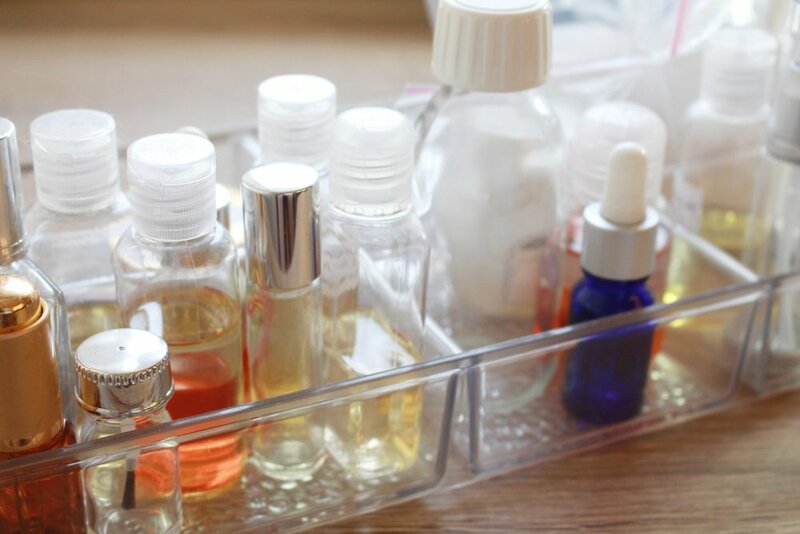 Following the guidelines from The International Nomenclature of Cosmetic Ingredients (INCI), its inclusion in any formula can be listed down simple as fragrance or parfum so the best way to steer clear is to opt for fragrance-free formulations. Always follow storage and usage instructions. In general, it is best to keep products away from direct sunlight and extreme temperatures. I personally keep preservative-free formulas I like in the fridge right after opening. Keep proper track of the expiration dates of your products. It would also be helpful to note the date products are opened, to better track PAO dates. Always be on the lookout for changes in scent, texture, and color, and don’t hesitate to chuck anything past the use by dates. Whenever possible, choose packaging that helps limit product interaction with air, light, and possible contaminants. While no current product packaging options are able to guarantee 100% protection, the best option would be opaque airless pump packaging. Avoid using hands to pick up product - spatulas, wands, and other applicators are more sanitary. Make sure not to double-dip though, and sanitize the applicator in between uses. There are many misconceptions about preservatives so the next time you see scary news about how they’re bad for you, do a little research before you believe in what they have to say. It’s always a good idea to find proven, reliable sources before getting carried away by Facebook memes. Do you pay attention to the preservatives used in your beauty products? What do you do to keep your products from expiring too fast?